How has CholestoRite helped others? How do I use CholestoRite? 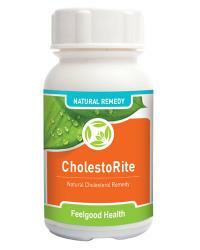 Can I use CholestoRite together with my prescription medication for high cholesterol? Cholesterol is a fatlike substance that circulates in the blood and is produced by the body from dietary cholesterol and saturated fats in food. Cholesterol is not harmful if kept within acceptable limits. It is used by the body to perform a variety of vital functions, including building and maintaining cell membranes, hormone synthesis, and the manufacture of Vitamin D. It is only when blood cholesterol levels become too high, that too much cholesterol can become a problem. There is a definite link between high cholesterol levels and a diet high dietary cholesterol and saturated fat, although genetic factors also play an important role. Smoking, being overweight and insufficient exercise can also contribute to high cholesterol levels. High cholesterol levels often exist without any significant symptoms and many people only discover the problem after they have had heart problems like angina or even a heart attack. If your cholesterol levels are very high, you may notice small yellow nodules beneath the skin of your eyes, eyebrows or elbows. Although it is possible to do a home test (obtainable from your pharmacy), these tests only measure total blood cholesterol levels and do not measure HDL. The best way to find out whether you have high cholesterol levels is to visit your doctor, homeopath, naturopath or other health care provider. Healthy adults should have their cholesterol levels measured at least every five years and more frequently if they are overweight, already have a cholesterol problem or if there is a family history of heart disease or high cholesterol. It is very important to take steps to control your cholesterol levels. If it is left untreated, high cholesterol can result in heart disease or even stroke. The good news is that high cholesterol can be well controlled by combining a healthy lifestyle with the correct medical treatment. This can include synthetic prescription medication, natural remedies or a combination of both. If you are already taking prescription medication to control cholesterol levels, it is important to consult your doctor before making any changes. In response to soaring rates of high cholesterol and atherosclerosis, the pharmaceutical companies have produced a class of drugs which are collectively known as 'statins'. The statins have a one diminsional effect of reducing the body's ability to synthesize cholesterol. They do not, however, distinguish between the 'bad' cholesterol (LDL) and the 'good' cholesterol (HDL) and can also reduce levels of Co-enzyme Q10 and L-carnitine, two very important molecules which are involved in energy production and fat metabolism. Myalgia and even stomach, lung and liver tumors have also been associated with the use of these drugs. It is very important that people who are taking prescription medication for high cholesterol be regularly monitored by their doctor. Like high blood pressure and high blood sugar levels, high levels of LDL cholesterol are recognised as symptoms of imbalance in the system. Naturopaths recognise that the whole system and not just the symptoms should be treated. Research has demonstrated that a combination of natural remedies, regular exercise and dietary changes can make a significant difference to LDL levels and reduce or even eliminate the need for prescription drugs. This is a much healthier approach and one which will have far reaching benefits in terms of quality of life and general well-being. Recognising the need for a healthier and more effective approach, without the side effects of the statin drugs, Feelgood Health has developed CholestoRite - a 100% herbal remedy containing well researched ingredients and manufactured in therapeutic dosage according to the highest pharmaceutical standards. CholestoRite not only lowers LDL cholesterol, but also increases levels of HDL, the 'good' form of cholesterol that helps to remove excessive HDL from the bloodstream and prevent the buildup of plaque in the arteries. Regular use of CholestoRite can help to balance the system and prevent heart disease and stroke, as well as ensure healthy arteries. Because CholestoRite also contains herbs that have anti-oxidant properties, CholestoRite can prevent the damage caused by free radicals in the system. Research has shown that free radicals (unstable oxygen molecules) are implicated in the build up of coronary plaque, leading to atherosclerosis, heart attack and even stroke or cancer. "High cholesterol runs in my family, but as usual I thought I would never have that problem. When my doctor told me that I had this problem I realised that I had to make some changes. I believe in natural medicine and my doctor knows this so she agreed to let me try your product which I found on the internet. After only one month there was an improvement and after two months my cholesterol levels were down to normal. I am very happy with this product and can recommend it to anyone with a similar problem." "I was taking prescription drugs which I don't agree with but was not sure about natural remedies for such a serious thing as high cholesterol. I tried Candidate with the permission of my doctor and can really say that it works with no side effects as well. I am so happy that I am also going to try Mindsoothe for my depression instead of Prozac which gives me so many problems. Thanks for all the advice and support which you gave me in the emails." CholestoRite contains the following therapeutic herbs in a 100% vege-capsule. Red Yeast Rice (Monascus purpurea) is an ancient Chinese remedy which has been used for centuries, both medicinally and in the preservation and colouring of food. The beneficial effects of Red Yeast Rice on balancing blood cholesterol levels have also been clinically demonstrated in a number of double blind, placebo controlling studies involving thousands of people. These studies have demonstrated that Red Yeast Rice can cut levels of LDL ('bad') cholesterol by as much as 15%, which compares favorably with similar cholesterol lowering effects of prescription drugs. Gugulipid is an extract of Commiphora mukul, the gum resin of the mukul myrrh tree. It is a highly prized and well known Ayurvedic herb, used for hundreds of years in the treatment of obesity and arthritis. Recent studies have shown that gugulipid can be even more effective than many prescription medications in lowering cholesterol and tryglyceride levels in the blood. (between 14 and 27% reduction in cholesterol levels over a 12 week period) Even more importantly, gugulipid has also been shown to increase levels of protective HDL cholesterol. Other studies have demonstrated that regular use of gugulipid has helped to prevent the build up of plaque in the arteries and even to reverse the build up of existing plaque. It also prevents blood platelets from sticking together, thereby reducing the risk of blood clots, which often cause heart attacks. Gugulipid has powerful anti-oxidant properties, thereby providing protection and benefit to the entire system. Aspalathus linearis (Rooibos) is a medicinal herb indigenous to South Africa and is widely used for its restorative and anti-oxidant properties. Rooibos can help to control blood sugar levels, lower blood pressure and enhance immune functioning. It is an extremely nutritious herb, containing Vitamin C, Alphahydroxy Acid, potassium, copper, magnesium, calcium, iron, zinc, manganese and fluoride. Dosage: Take 1 - 2 capsules 2-3 times daily. Caution: Safety in pregnancy has not yet been established. Use only under medical supervision if you are also using prescription medication for high cholesterol, if you are a transplant patient, have liver problems, drink more than three glasses of alcohol a day or have other serious illnesses. Yes, under some circumstances you can - but NOT without consulting your doctor. The ingredients in CholestoRite and Candidate are highly effective in reducing cholesterol levels and are generally seen as a healthy and natural alternative to prescription cholesterol drugs. Research has shown that regular use can be just as effective as the prescription drugs in lowering blood cholesterol levels, with the added benefit of increasing the production of protective HDL levels. If your doctor is not familiar with natural remedies or is unsympathetic towards your quest for a healthier alternative, seek a second opinion. Studies have shown that using the ingredients in CholestoRite can result in a significant drop in blood cholesterol levels over a 12 - 16 week period, although many people respond sooner. Systemic imbalances, including high blood sugar and cholesterol levels and high blood pressure are often linked to a condition called Candidiasis, which is associated with the overgrowth of systemic yeast or candida albicans. Symptoms include chronic fatigue, recurring fungal infections (thrush, athletes foot) and decreased resistance to illness. Candidate is a herbal remedy developed by Feelgood Health and especially formulated to prevent systemic yeast overgrowth and to restore the balance of healthy bacteria in the gastrointestinal tract. Containing Lemon Grass, Calendula officinalis and Pau d'Arco, Candidate comes in convenient and concentrated tincture form and is an excellent adjunct to CholestoRite. The Feelgood Health Cholesterol Power Pack includes CholestoRite Capsules, Candidate Drops and a FREE Candida diet sheet and comes with a 10% discount. Can Come Rite: Address systemic Candida and Cholesterol levels!